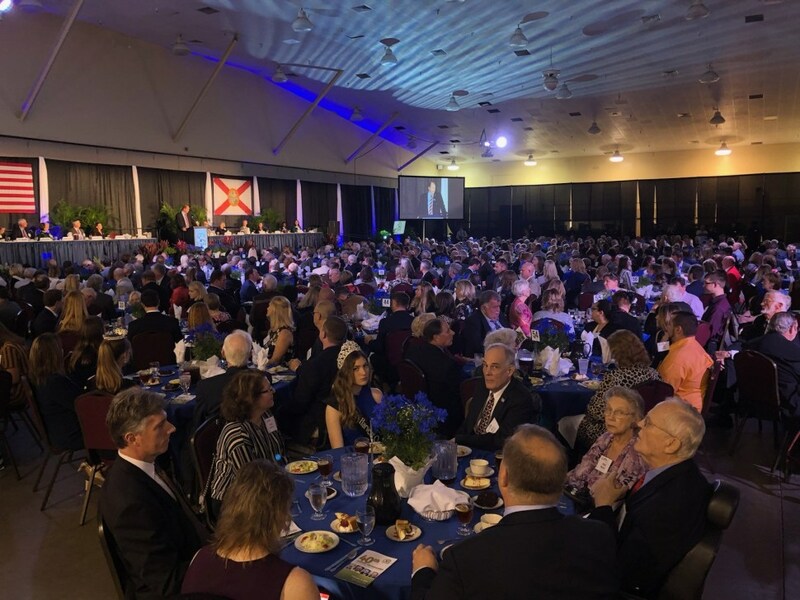 The 40th Florida Agricultural Hall of Fame banquet took place last night in the special events hall on the Florida State Fairgrounds in Tampa. Four distinguished ag leaders were inducted into the hall of fame. The evening began with a reception, during which agriculturalists from different industries were able to mingle and catch up with old friends. Following the reception was dinner and a welcome from the master of ceremonies, U.S Congressman Ted Yoho. Yoho has been known to be a champion for Florida Agriculture during his four terms in Congress. Newly-elected Florida Agriculture Commissioner Nikki Fried announced the inductees: Don Bennink, Richard Gaskalla, Sam Killebrew Sr. and Michael Stuart. Don Bennink spent a distinguished career revolutionizing the dairy industry by spearheading innovative genetic research and practices. The hallmark of Bennink’s career is his research in animal genetics and reproduction, which led to the development of his own system of genetic selection and genomic testing. A native of western New York, Bennink moved to Bell in 1980 where he established North Florida Holsteins. Bennink became a regarded advocate for improving the Holstein breed, and in 2001 he began using tunnel-ventilation barns to make cows more comfortable and productive. Recognizing the value of partnerships between universities and veterinary students, North Florida Holsteins has become a field laboratory for the University of Florida’s College of Veterinary Medicine and Ohio State University’s well-respected international student internship programs. Bennink has earned numerous awards and honors, including the World Dairy Expo’s Dairyman of the Year. Richard Gaskalla spent more than four decades defending Florida agriculture from invasive pests and diseases. Gaskalla began his career at the Florida Department of Agriculture and Consumer Services’ Division of Plant Industry and was promoted to director in 1988. Gaskalla was on the forefront of researching and implementing techniques to protect and preserve Florida’s citrus industry by directing the Citrus Canker Eradication Program and collaborating with the U.S. Department of Agriculture (USDA) and the University of Florida’s Institute of Food and Agricultural Sciences to establish and implement the Citrus Health Response Program. Ted Yoho addresses a huge crowd at the Florida Agricultural Hall of Fame banquet. Gaskalla has earned numerous industry accolades, including the USDA’s Administrators Award; Florida Nursery, Growers and Landscape Association’s Friend of the Industry Award; and the Commissioner of Agriculture’s Distinguished Achievement Award. Sam Killebrew Sr. revolutionized the agriculture industry with his patented invention of the bulk fertilizer hauler in 1952. The hauler provided an easier, more efficient and cost-effective way to deliver nutrients to multiple crops, most notably citrus. The hauler, known as “The Killebrew,” eliminated the manual handling of fertilizer, including bagging, opening and dumping into spreaders. Killebrew moved from Tennessee to Auburndale to work as a trucker and mechanic, and eventually worked for Adams Packing Company, where he learned to weld and devised the hauler. Killebrew invented additional tools to reduce costs and streamline farming practices, including dry and liquid fertilizer spreaders, logging trailers, city refuse units and bulk citrus high-lifts. Killebrew is an inductee of the Florida Citrus Hall of Fame and the Southwestern Fertilizer Conference Hall of Fame. Michael Stuart has dedicated his career to improving and supporting Florida’s produce industry by cultivating grower-shipper relationships, securing federal investment in fruit and vegetable programs and shaping trade policies. Stuart began as a produce clerk in California before taking a position with Western Growers Association, where he served produce growers in California and Arizona for 13 years. In 1992, Stuart began his 26-year tenure as Florida Fruit & Vegetable Association president, serving as a highly respected leader, ambassador and spokesperson for Florida’s specialty crop industry. At the federal level, Stuart helped craft critical fruit and vegetable investment programs as co-chair of the Specialty Crop Farm Bill Alliance, and he held several government advisory positions to ensure trade agreements reflected the interests of the specialty crop industry. For more information on the Florida Agricultural Hall of Fame or to nominate someone, click here.